The classic definition of sustainable development is meant to be an all encompassing statement that can be applied at a wide range of scales, from international development to backyard gardens. However, it is recognized that the implementation of this ideology differs drastically depending on the environmental, economic and social factors. The path towards sustainable development for a large city in the northeastern United States, is not, and cannot be, the same for a small community in the semi-arid conditions of south Eleuthera. 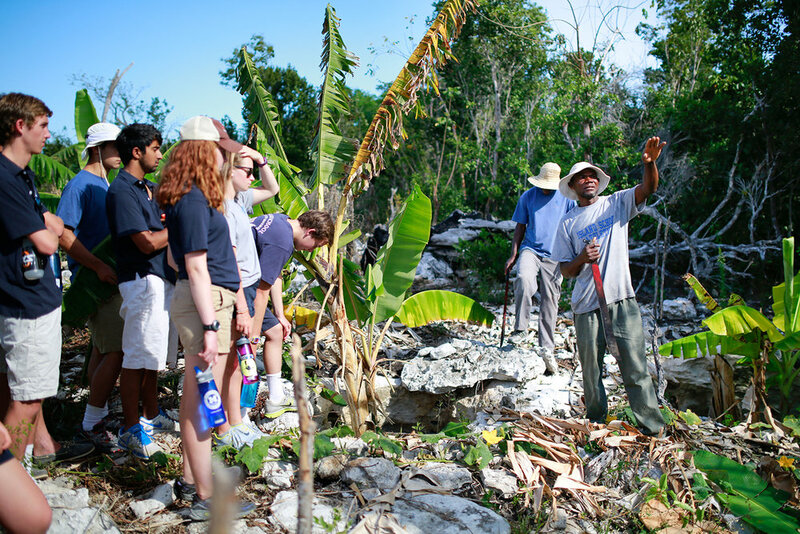 Our location, at the south-western tip of Eleuthera, Bahamas, is an ideal location as we tackle “one planet living” challenges on a small community scale everyday. We model a sustainable ecological footprint through environmental management, human consumption and waste management. Demonstrating opportunity at a local level. Since its founding, the Cape Eleuthera Island School and affiliate organizations have employed Bahamian professionals in the realms of education, research and sustainable design and development. Education and outreach are the aspects of social sustainability founded in our organization’s mission. With the campus as the classroom, we seek to inspire others to live what we teach while carefully considering our relationships to local, national, and international communities. Like other communities, we look to create our own framework, defining our path of sustainable development. Our framework must allow us measure both our success and failures, allowing us to celebrate that which we have done well, and allow us to learn from our mistakes. We must be able to assess the priority of our projects from the perspective of the organization, and our greater community. More specifically, we align our efforts under 4 initiatives: Food Security, Energy, Water and Sustainable Design. Most electricity in The Bahamas is generated via large diesel generators. Given the rising price of fossil fuels, antiquated design and failing infrastructure, the price of electricity in The Bahamas is now one of the most expensive in the world. The campus currently has a 71.2 kilowatt production capacity, with approximately 85% of the production from photo-voltaic panels. Working in partnership with the Bahamas Electricity Corporation (BEC), we have installed the only grid-tie system in all of The Bahamas. We look to build upon our success, increasing the our renewable energy production to the level of net-zero importation. The most inexpensive and efficient kilowatt-hour is the one you never used. Yet because electricity consumption is ubiquitous, and the amount of energy used abstract, conservation has always been difficult. As part of our educational effort, Campis (Campus Information System) was created. Our system is capable of monitoring electricity consumption and production on campus, energy import and export to the utility. We look to expand the system by creating a greater granularity to our measurements, as well as including the measurement of environmental data. We operate a community scale biodiesel facility that provides over 10,000 gallons a year of ASTM D-6751 quality biodiesel to our organization, meeting our fuel needs for our vehicle fleet, construction equipment and stationary generators. In accordance with our dedication to developing zero-waste systems, biodiesel takes used cooking oil, an unwanted waste output, and transforms it into a usable motor fuel source. Modelling energy independence, we look to expand our current facility, allowing us to increase production using the fuel for our marine fleet of vehicles as well. The two-stage anaerobic digester improves upon the conventional method of handling sanitary waste in The Bahamas, which is either spreading in a field, or engineered solutions that involved chemicals and deep well injection. Anaerobic digestion offers the opportunity to produce energy from a waste stream, cleaning the waste stream and providing nutrients for use in agricultural activities. CSD looks to the anaerobic digester as another input to the Waste-to-Energy plant that will share energy across multiple processes and pieces of equipment. Prospective research is in the areas of increased efficiency in biogas production, and effective means of utilizing this energy source either for cooking, heat, or electricity production. Wastewater effluent from The Island School’s sanitary waste systems has traditionally been treated using passive bacterial treatment in wastewater gardens. During the winter of-2017, a modified trickling filter was installed, as the first effort at an engineered system to confidently treat sanitary waste. A hallmark project for the Center for Sustainable Development is the design of a Waste-to-Energy Plant that will share energy in the form of heat, liquid, or solid fuel across processes involving each of our sustainable initiatives. The plant will act as a central energy consolidation hub that will transform waste heat, municipal solid waste, or local, invasive hardwood into electrical energy or process heat for biodiesel. The overarching concept for the Waste-to-Energy plant is to showcase all of the Island School’s sustainable initiatives in one location, and meet the goal of zero waste. One process’s waste is another process’s energy source. True food security can only be established when people, profits and the planet are all taken into consideration. The overall goal of the food security program to establish working models, that demonstrate viable and sustainable methods of planting, production and harvesting. Permaculture is a design system that incorporates plants, animals, buildings, and infrastructures such as water, energy, and communication to create sustainable human environments. The focus of permaculture is on the relationships created between these elements by the way they are grown or placed in the landscape. In essence, permaculture is based on mimicking the natural environment and using the inherent qualities of plants and animals within their natural landscapes to produce a regenerative life-supporting system. With the limiting factors that influence food production in The Bahamas, including nutrient-poor soils, high solar intensity, high winds, salt spray, and limited freshwater, an innovative design based on the principles of permaculture may provide an effective model for low-input, viable, and sustainable agriculture. The objective of the permaculture program is to create systems which are ecologically and economically sound, while serving as an educational model for all students. The goal is to determine the feasibility of aquaponics as a low-cost food production system for the region. Our model system currently utilizes water from rainwater catchments to ensure cost-effectiveness and environmental friendliness. Nile tilapia (Oreochromis niloticus) are raised in inexpensive tanks and grown under ambient temperature and light conditions to help minimize operating costs. A gravity flow system also helps to reduce costs by passively moving nutrient-rich water from the fish tanks, through a clarifying tank, biofilter, and ultimately into shallow growbeds. According to the EPA, the average American family of four will use 400 gallons of potable water a day, with 70% that usage occurring indoors. In contrast, the average community member of CEIS is challenged to use less than 15 gallons a day. Water conservation is mandatory for all students and collaborators, education about responsible usage is one of the first educational experiences for any visitor to our campus. The Center for Sustainable Development was built upon the largest cisterns to date, capable of storing over 170,000 gallons of rainwater for use throughout the campus during the dry season. The isolation of the campus provides a unique challenge, as there is no municipal infrastructure to rely on, while the size of the campus provides all the requirements of a small village. Most construction to date relies upon the use of constructed subsurface-flow wetlands that act as bio-filters, removing ammonia, nitrate-nitrates, BOD, and suspended solids. The beginning of 2012 saw the completion of the campus bio-digestor. This project, which was sparked through the human ecology classes of The Island School, was a first for both our campus and The Bahamas. The system is designed to accept sludge from all our septic systems, glycerine from bio-diesel production, and fish waste from our aquaponics. Though an anaerobic process we are capable of producing usable methane, as well as fertile and safe effluent for use in our orchard. The buildings and grounds on our campus incorporate systems and design principles that minimize our ecological footprint through the conservation and sustainable use of our resources. We are the first institution in The Bahamas to employ such comprehensive, ecologically sound systems. There is great promise that our efforts will help change the way The Bahamas and other island nations manage supplies, process waste, produce energy, and conserve water. All visitors to our campus do their part in maintaining and managing these systems, learning first-hand the benefits of engineering that reflects a deep-rooted respect for the environment. We design spaces that reflect our values and help inspire creative thinking, while reducing the immediate and long-term impacts on the surrounding ecology. From onsite power and water harvesting, to locally derived building materials, native landscapes and innovative waste management strategies – we continually strive to improve our ability to live in more meaningful and less harmful ways. International recognition for the current IS and CEI campus, as well as the future DCMS campus.